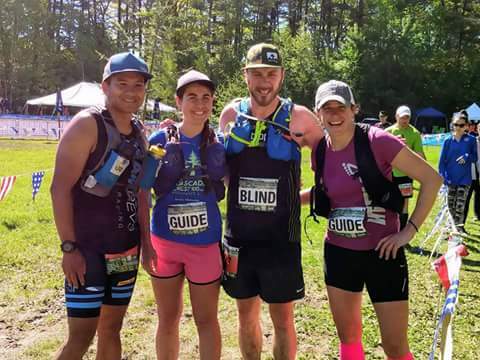 The 2017 Vermont 100 will be the first ultra ever to formally recognize Athletes With Disabilities with an awards division for ultra runners with visual or mobility impairments, and we’re so proud to bring you this interview with Kyle Robidoux in anticipation. Kyle at the 2017 Pineland Farms 50-miler, alongside his guides, Nat, Nicole, and Amy. Kyle Robidoux is an ultra runner from Boston who will be among the historic inaugural cohort at this year’s 2017 VT100 recognizing athletes with disabilities. Kyle has completed many marathons, including completing the Boston Marathon twice in one day by running out to the starting line, and then running back to the finish! He’s also run the Vermont 50 at Mount Ascutney, Ghost Train Ultra in New Hampshire, and Pineland Trails Ultra in Maine. Born with retinitis pigmentosa, a degenerative eye condition that gradually limits an individual’s field of vision, Kyle is a Vermont Adaptive Ski and Sports participant and will be competing in the VT100’s new visually impaired awards division. This will be his first 100 mile race. When Kyle is not running, you can find him hanging out with his wife and 9 year old daughter, Lucy, enjoying an interesting micro-brew, and advocating for inclusion as the Director of Volunteer Services at the Massachusetts Association for the Blind. Q. How has your training been so far? How do you train for trails while living in the city? Kyle: My training has been on-point and I am hitting all of my weekly mileage goals. Living in the city definitely makes it a challenge to run trails and hills. I spend a lot of time doing multiple hill repeats on the steepest hills in Boston. Thankfully, I have some great friends and sighted guides who also drive/run with me to nearby trails such as The Fells and Blue Hills. Q. We’re about four weeks away from race day. What does your training block look like for the next four weeks? Kyle: The last three weeks of my plan will be my largest training block to date. Each week will set a new weekly high for mileage which is exciting and keeping me motivated. I am focusing on back-to back-to back runs Fridays-Sundays to train my body and mind to run on tired legs. I am very thankful for my family’s patience with my training. Q. What are your race goals and what is your race day strategy? Kyle: My A+ stretch goal is just under 24-hours. This hopefully will keep me motivated to keep moving forward. My B goal is 26 hours and C is to finish. My strategy is to keep an even effort for the first half while knowing that the terrain is more challenging the last 30 miles. For trail running, terrain often dictates my pace/ability to run/walk (except for hills), so I will be smart and take what the trails give me. Quote from a VT finisher from last year: “Don’t run like an idiot the first 50, and don’t run like a wimp the second 50” will be my mantra. Q. Who will be guiding you? Kyle: I am incredibly grateful to have six runners who are sharing their sight as guides and some of whom are driving up from Pennsylvania and New Jersey. I’m honored to have Amy Rusiecki guiding me for the first 15 miles and whose leadership, along with the race committee, made the Athletes With Disabilities division possible. A few of the guides I train with on a regular basis, a few I will meet the weekend of including my Team Nathan teammate Maggie Guterl. Kyle: Much like other divisions, runners take great pride in being able to participate in a division of their peers. The same holds true for runners with different abilities. I encourage Race Directors to reach out to local athletes and organizations that support athletes with disabilities to begin a conversation on how they can make their race inclusive and open to all runners. Want to learn more about AWD? Check out the VT100’s post on AWD Division Rules & Regulations or this amazing interview with 2017 AWD participant Jason Romero. Want to help Vermont Adaptive Ski & Sports continue to champion athlete’s like Kyle? Consider visiting the VASS site to learn more or to make a donation. *The VT100 is proud of all of the participants of our events, from the racers to volunteers to land owners who grant us access to their beautiful property to enjoy the weekend. So, we like to take time to feature some of these people and get an inside look at their perspective on the race and how they help make it thrive. If you know anyone who would make a good interviewee, please contact us in the form below and we’ll see what we can do!